The illustrious musician D’Arcy Trinkwon is one of the outstanding artists of his generation, whose fervour and passion embody that of the true Romantic virtuoso in the service of their art. He has devoted his career to revealing the beauties (and mysteries) of the organ and its music to as wide an audience as possible without musical compromise. Respected for his dedication to the organ as a concert instrument, his instinctive affinity with the organ is grounded in scholarship and an encyclopaedic knowledge of his art. His vast repertoire is one of the most extensive of any artist before the public and includes all the established masterpieces of all periods. 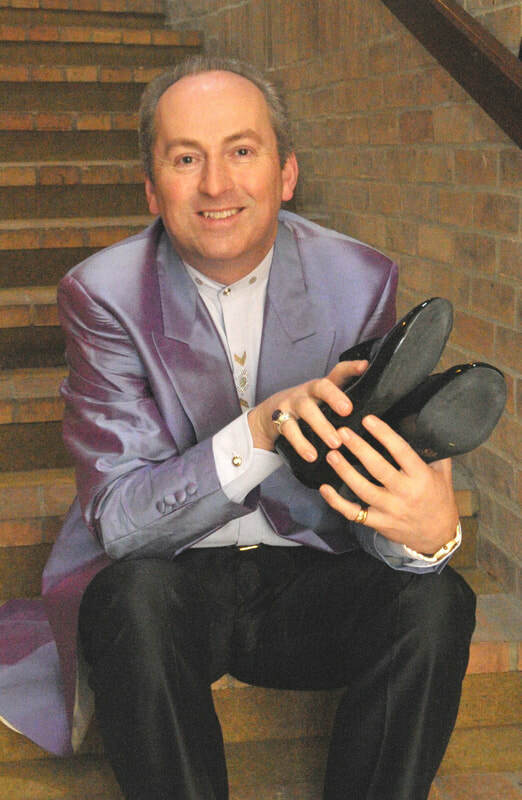 Alongside his concert career he is Organist of Worth Abbey (OSB) and Organist to the University of Sussex. Following the great success of his Franck series and closing recital of the Arundel Festival last year, D’Arcy returns to Arundel Cathedral this summer to perform the complete works of Brahms and Schumann, and the great works of Mendelssohn and Liszt in four concerts: each concert is devoted to each composer. The current academic year's series - Travel the World - features organ music from all over the world. The legendary Jeanne Demessieux died on 11 November 1968: to mark 50 years D'Arcy gave a recital at Westminster Cathedral on 11 November 2018. Demessieux made her UK debut at the cathedral on 26 February 1947 and performed numerous subsequent concerts and BBC broadcasts. 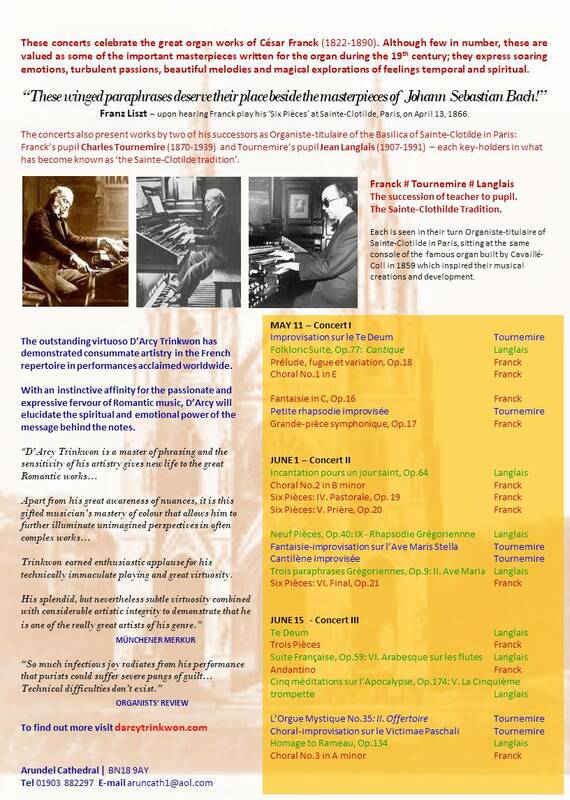 Church Organ World in their publication Organ News. D'Arcy gave the UK concert premier of two works of the French composer Thierry Pallesco - Le salut messianique & Vers toi, Seigneur, j’élève mon âme - at Worth Abbey. 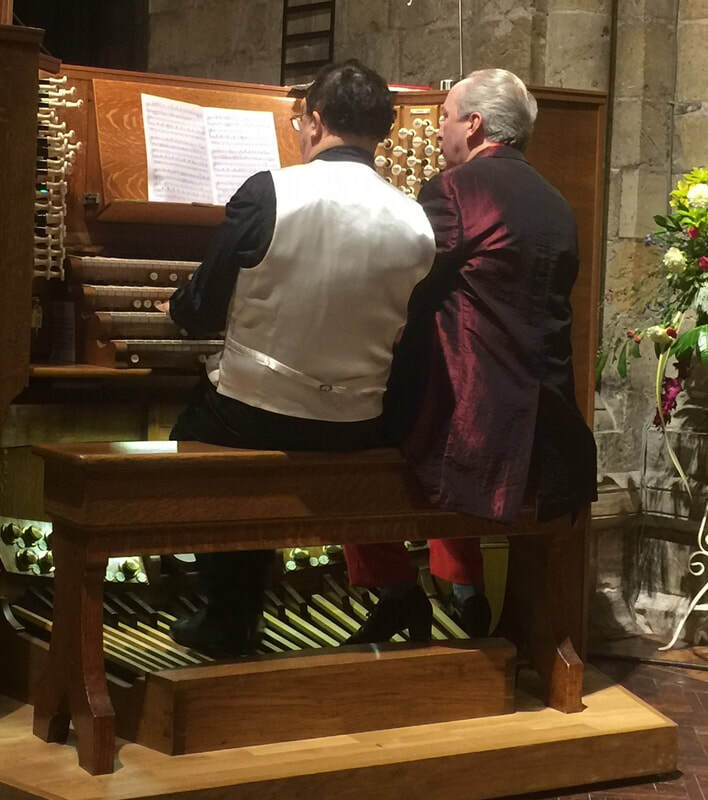 John Scott Whiteley and DT performed with resounding success - and great fun - before a full nave in Selby Abbey in a concert featuring both the Abbey's famous, recently restored Hill organ and a new Regent Classic organ. D’Arcy again performed the complete great works of Franck which he presented in Arundel in a series which included works by Franck's two famous successors as Organiste-titulaire of Sainte-Clotilde, Paris: Tournemire, and Langlais. The Sainte-Clotilde Tradition. See the full programme & music performed: read more. These include excerpts from several concerts (both video & audio) as well as excerpts from a DVD D'Arcy recorded as part of the fund-raising project to restore the famous Hill organ in Selby Abbey. This was completed in 2017. ﻿“Music is a moral law. It gives a soul to the universe, wings to the mind, flight to the imagination, a charm to sadness, and life to everything. "A musician cannot move unless he too is moved." "Every composer and musician writes and makes music in the very likeness of himself."